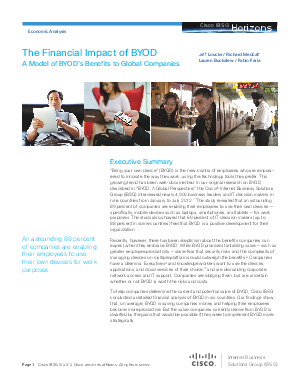 To help companies determine the current and potential value of BYOD, Cisco IBSG conducted a detailed financial analysis of BYOD in six countries. Our findings show that, on average, BYOD is saving companies money and helping their employees become more productive. But the value companies currently derive from BYOD is dwarfed by the gains that would be possible if they were to implement BYOD more strategically.